At National Geographic: Using Engineering Ingenuity to Bring Us Stunning Remote Images of Archeological and Ocean Exploration! As a mechanical engineer with the National Geographic Society’s Remote Imaging Team, Alan Turchik uses the latest technology to support archaeological expeditions, ocean explorations, and other scientific endeavors across the globe, from the Middle East to the middle of the Pacific. He first made his mark in engineering while a senior at the University of California, San Diego’s (UCSD) Jacobs School of Engineering where he developed a Self-stabilizing Aerial Camera Platform for the National Geographic Engineers for Exploration program. His invention greatly improved the ability of archeologists to remotely view archeological sites by motorizing the aerial platform on which research cameras are mounted. This camera platform was one of the first projects funded by the UCSD Engineers for Exploration program. This program was initially a collaboration between NGS and the California Institute for Telecommunications and Information Technology (Calit2) at UCSD. The program enlisted teams of UCSD undergraduates from a variety of disciplines to develop ruggedized systems for NGS projects. 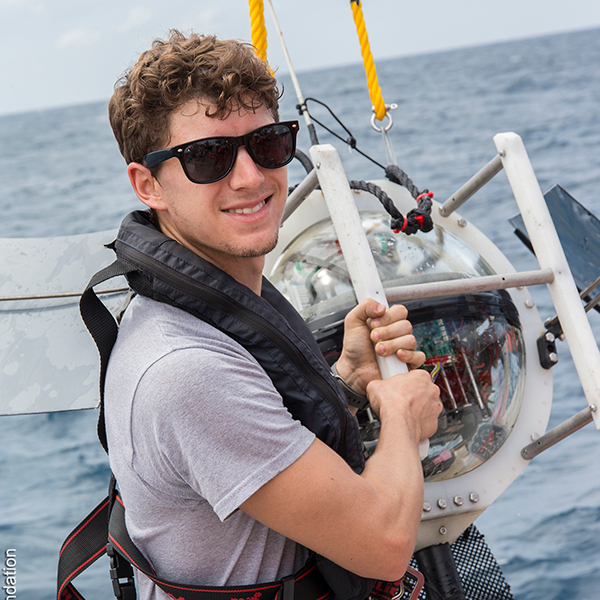 Upon graduation from UCSD in 2011, Alan officially joined the National Geographic team and currently plays a more integral role in NGS projects, most notably ocean exploration endeavors in the South Pacific and North Pole. He uses his ingenuity and innovation to help investigate the ocean’s depths via sophisticated visualization devices such as deep ocean dropcams. Deep ocean dropcams are camera and computer-based devices that can be deployed thousands of feet down into the deep ocean with the intent of capturing images of the wildlife there. Alan has traveled around the world to employ these systems. Normally out at sea for weeks at a time, Alan will deploy the deep ocean dropcams in waters often miles deep. His work has generated hundreds of hours of footage of the deep ocean floor, frequently in places where images have never been recorded. This footage has allowed scientists to gain an understanding of the deep ocean environment and the creatures that live there. It has even led to the discovery of fifteen potential new species of deep water fauna. Beyond his work with the deep ocean dropcams, Alan has been instrumental in the development of a variety of technologies used in all types of exploration. From camera traps that capture candid images of wildlife, to aerial drones that take stunning images from the air, Alan is firmly committed to applying his engineering skills to assist photographers, filmmakers and explorers in their documentation of our world. He continues to travel with National Geographic, and has participated in over a dozen projects with a variety of scientists. His passion for creating solutions to difficult field problems will hopefully yield even more discoveries in the future.